A T-shirt by itself is a beautiful blank canvas, ready to be transformed into literally anything with the help of some well-placed coordinating pieces. Add a pair of light-wash jeans and you have yourself a quintessential Americana outfit. Mix with a fancy silk ballgown skirt and you're a modern-day Cinderella. Seriously, you can do anything with a simple white T-shirt. For the ever-stylish Camille Charriere of Camille Over the Rainbow, she has concocted a fabulous outfit centered around a plain white tee. 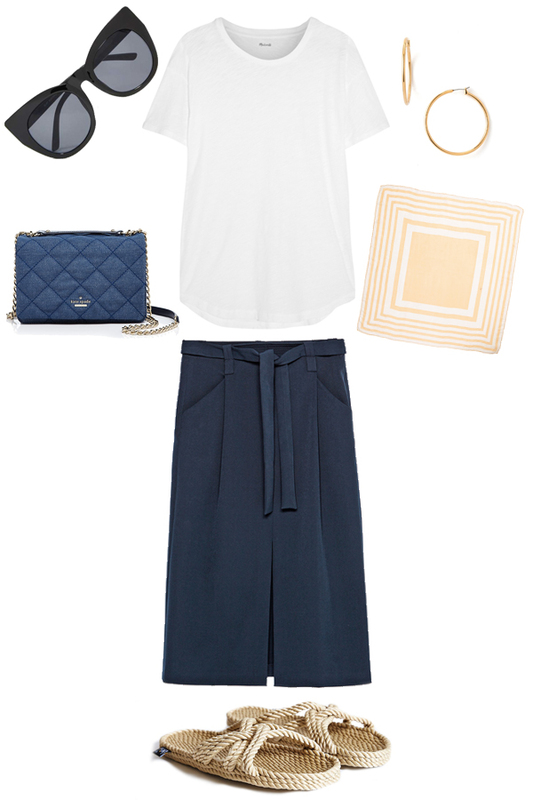 Paired with a silk neck scarf, a utilitarian navy skirt, and summery rope sandals, this is a perfect look for an August day. She chose to wear it while biking around, but it could work just as easily for a weekend brunch or a picnic in the park. Bonus: if you switch out the rope sandals for pointed pumps, you have a stylish work outfit. See! The white T-shirt is totally versatile. What do you think of Camille's look?